So I’ve been busy, too busy to cook regularly and too busy to blog about what I have cooked. My new years resolution for 2017 is to cook more and to blog about it quicker, though this might require me to be less busy. We’ll see how it goes. And Happy New Year for 2017. May your cakes cook evenly, your roasts be golden, and your kitchen full of the smell of tasty and delicious food. I cooked from The International Garlic Cookbook, which is a bit of a stretch in my opinion as to the name at least. I cooked three dishes, and well… it could have done with more garlic. Even though all the recipes had garlic in them, some of them needed more. The instructions were good (probably it’s been ages since I cooked from this book), though all the measurements are imperial (eugh), and it’s a nice small compact book. I do remember saying that we’d cook the chicken again because it was quite tasty. Overall 3.5 stars out of 5. Preheat the oven to 200C. Arrange the eggplant, cut side down, on an oiled baking sheet and bake until tender, about 20 – 25 minutes. Let cool, remove the skin, and coarsely chop the pulp. In a skillet over medium heat, warm the oil until hot. Add the onion and garlic and cook, stirring, for 3 minutes. Add the tomatoes with puree and simmer, stirring occasionally for 10 to 12 minutes, until thick. Add the chopped eggplant and salt and pepper to taste, and simmer, stirring occasionally, for 5 minutes, until heated through. Stir in the basil, keep the sauce warm. Bring a large pot of salted water to a boil. Add the spaghetti and cook, stirring occasionally, until al dente (usually about 10 minutes). 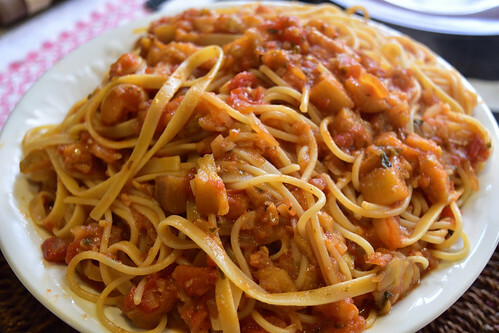 Drain the pasta, transfer it to a heated serving bowl, and toss gently with the sauce. 4 garlic cloves sounds like a lot of garlic, but it wasn’t even enough to taste. This was nice, especially covered in parmesan cheese. Sprinkle the chicken with the salt and pepper to taste. In a large skillet, heat the oil over medium heat. Add the chicken and cook over medium0high heat, turning once or twice, for about 6 minutes, until browned on both sides. Reduce the heat to low, cover and cook for about 25 minutes, until the chicken juice run clear when pierced. Remove with a slotted spoon to a plate. Add the garlic, rosemary, and oregano to the skillet and cook over medium-low heat, stirring frequently, for about 2 minutes. Add the wine and bring to a boil over high heat, stirring to scrape up any browned bits from the bottom of the pan. Gently boil the sauce for 2 – 3 minutes, until it has thickened slightly. Stir in the hot pepper sauce and Worcestershire sauce. 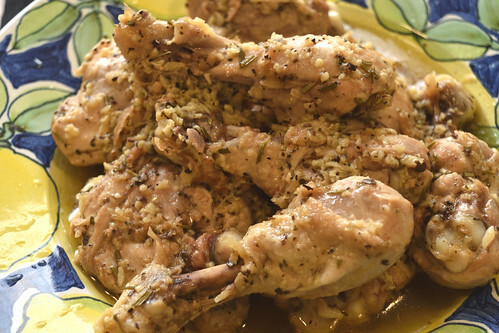 Return the chicken to the skillet and cook over low heat to warm through. Serve the chicken with the sauce spooned over it. Tasbasco level – needs more tabasco. It was a lovely flavoured dish, but there was absolutely no bite to it at all. 2 large garlic bulbs, cloves separated and peeled. Bring a large saucepan of salted water to a boil over high heat. Add the potatoes and garlic, reduce the heat to medium high and boil gently, uncovered, for about 20 minutes, until the ptoatoes and garlic are tender. Drain well. Transfer the potatoes and garlic to a large bowl. Add the butter and coarsely mash the potatoes and garlic. Make a well in the centre of the potatoes and pour in the warm milk. Continue mashing until light and creamy. Season to taste with salt and pepper. Garlic level – needs more garlic. Sure you’re boiling the potatoes with garlic, but all the flavour leaches out into the water and disappears. 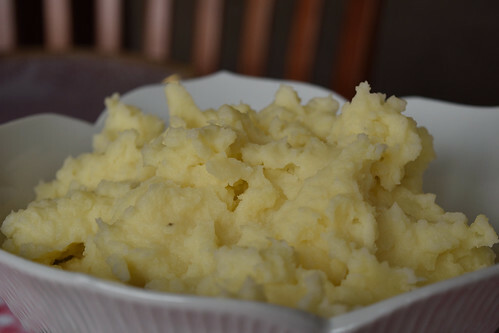 This is a better mashed potato with garlic recipe.